Kickstart and obtain initial validation for product design work to maximize the chances of creating something people want. The Design Sprint gives teams a shortcut to learning. Instead of waiting to launch a minimal product to understand if an idea is good, you’ll get clear data from a realistic prototype. The format of the Design Sprint (including Design Sprint 2.0) gives teams a way to focus the attention on the team on a very specific problem. It works particularly well when there is no obvious solution to your challenge, and the problem is meaningful enough and challenging enough that employees from different groups need to work together to find a solution. At the beginning of a project: you can use a Design Sprint to start the innovation of a product concept. This works well when you’re exploring opportunities with the goal of coming up with original concepts and needs to be tested in the real world. In the middle of a project: you can use a Design Sprint to start a new cycle of updates, expanding on an existing concept or exploring new ways to use an existing product. For a mature project, the Design Sprint can also be used to test a single feature or subcomponent of a product. This allows you to focus in on an aspect of the design. There is a wealth of resources available helping you to prepare how to facilitate a Design Sprint (including the Design Sprint book, the YouTube channel of AJ&Smart with specific guidance for the Design Sprint 2.0 exercises, and this facilitation outline) and by reviewing all these resources, you should get a thorough understanding of the process. Nevertheless, familiarity with innovation and product/service design workshop is highly recommended, as well as having a supporting team that has expertise in specific areas that will be needed during the workshop, such as Prototyping, Storyboarding, UX Design, User Testing. If you are looking for professional training on how to run design sprints, you may consider the Design Sprint Masterclass of AJ&Smart. 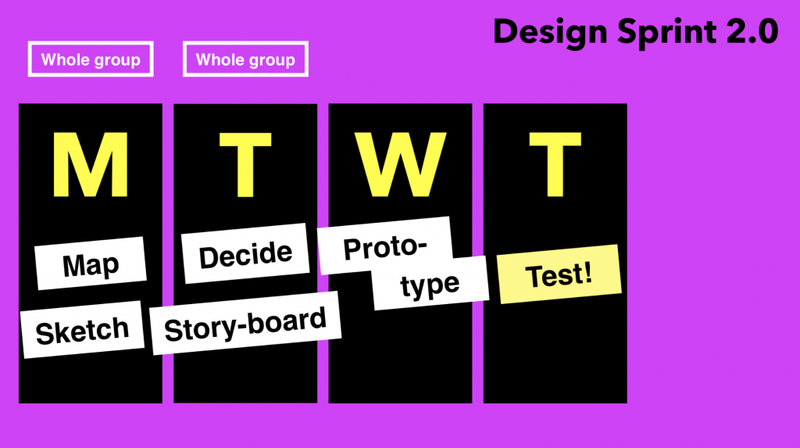 Design Sprint 2.0 is the most up-to-date, semi-official version of the Sprint, as of May 2018, developed further from the original Design Sprint framework by AJ&Smart and Jake Knapp. One of the biggest differences between the original Design Sprint and the Design Sprint 2.0 is that 2.0 is optimized to work not just in startups, but also in large organizations that don’t necessarily have time to commit an entire week to the full process. The Design Sprint is a five-day process to solve big problems and test ideas. A dedicated team discusses a challenge, designs potential solutions, and tests them with real users. You start with something vague, and finish with real feedback and something extremely tangible in just five days. You only need the full Sprint team for two days instead of five. Anyone who has ever dealt with senior stakeholders knows this is a major, major win. Clearing your calendar for five days is a massive sacrifice at any level, so getting the same Sprint results with committing just two days of time is huge when you’re trying to convince someone to authorize a Sprint. Jake Knapp is the author of New York Times bestseller “Sprint” and the forthcoming book “Make Time“. Jake spent 10 years at Google and Google Ventures, where he created the Design Sprint process. He has since run it over 150 times with companies like Nest, Slack, 23andMe, Uber, and Flatiron Health. Previously, Jake helped build products like Gmail, Google Hangouts, and Microsoft Encarta. He is currently among the world’s tallest aspiring novelists. AJ&Smart are a Product Design & Innovation Studio based in Berlin, Germany. AJ&Smart focus solely on the Design Sprint, and work with some of the world’s largest companies to help them solve their biggest problems in just 4 days, using the Design Sprint. 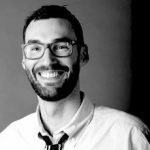 They also work closely with Jake Knapp, the founder of the Design Sprint and NY Times Best Selling Author, and together have trained thousands globally on how to apply the Design.